C-Minaire is a Cameroonian rap group composed of three artists (BAD DJEZZ, Bouddah Fai-TAAH and Jah Rahm) from the town of Yaounde best known for the concept of 6TM (cite M). Their style is basically Hip hop blended with African rhythms. The help of Protector (one of the pioneers of French Cameroon Hip Hop ) and Mapane Records, enabled the group C-Minaire to get integrated into ”Hip Hop Camer” . The group had their breakthrough after the release of the “Coca Cola Dream” compilation 2004. Songs like “L’envol” and “Peuple Bassa” were used as promotional tracks of the compilation. They released a compilation of singles dubbed “4×4 Tout terrain”. This compilation was a great success as they were nominated to perform in the 4th edition of L’ Assaba (Association des Alliances Bantu) in Ivory Coast. The album evokes several themes: the situation in Cameroon, orphans, mothers, students poor living conditions, and unemployment. ”Reveillez Vous” was directed and produced by NS Pictures. After two solo albums, Cameroonian rapper, El Gringo a.k.a Big Bzy is back with a brand new album ” One day , One D” produced by his label Kamer Sounds in partnership with DJ Rene’ s So Sound Records. Here is the video of ”J’en ai marre” extracted from the album. The video was produced by Kmer Sounds. 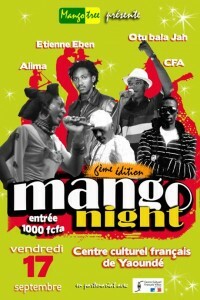 After 5 successful editions, the event management agency , Mango Tree presents the 6th edition of the “Mango Night. It is an event to discover young talents, a platform where artists seeking exposure are given the opportunity to share the stage with experienced artists. The event is 100% Live. 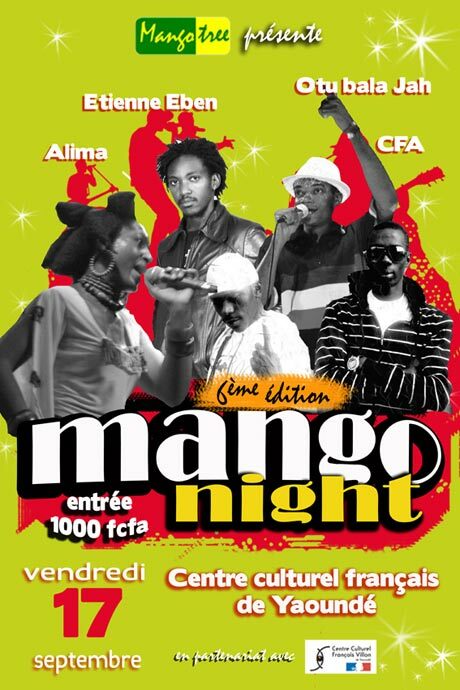 The venue of the event has been changed to Centre Culturel Francais,Yaounde unlike the previous location( Tam Tam). Stephane Mbia won’t play against Mauritius ! Stephane Mbia Etoundi has not turned up for any match since the World Cup in South Africa. Convened for the friendly match against Poland, he did not make the trip to Scsezin . Selected to meet in Mauritius this Saturday in preparation for the match against Mauritius, the Marseille defender would not take part in the encounter. Dr. Ngalle Mbonjo who is currently the head of the medical staff of the team confirmed that Mbia is injured. 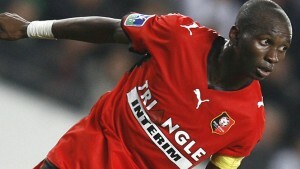 Stephane Mbia was injured during a third day encounter of the French league. His return is expected for the match against Monaco on September 12. 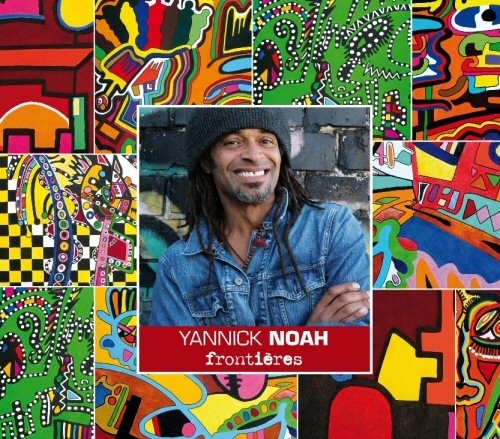 Hey people, we announced the release of Yannick Noah’s brand new album titled ”Frontieres’. Here is the video of ”Angela” extracted from the 13 track album. The song is a tribute to Angela Davis, who was an American civil rights activist . Suelaba FM 105 radio personality, Moïse Bangtéké is currently working on a 20 track album with Douala based producer, Mouasso Elame. The veteran presenter has been penning lyrics for several artists in the music scene including his wife, Nadia Ewande and has been a driving force behind her success. 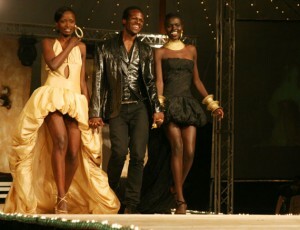 Moise Bangteke was the first radio presenter to air the song ”Zangalewa” by Golden Sounds. 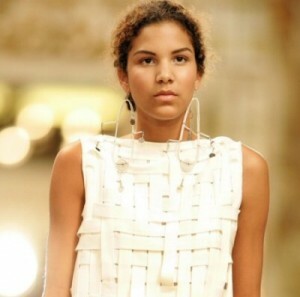 Imane Ayissi is a CamerBorn designer, model and dancer. He is the son of a family of sportsmen and artists; his mother was a model (Miss Cameroon 1960) and his father , a Box champion. Still young, he joined his family dance group ”Les freres Ayissi” and in 1986, he performed in the presence of 7 African presidents at the Yaounde Congress Hall. His talent paid off as he received several honorary trophies like the Trophy of cultural friendship (trophées de l’amitié de la culture) at the World Cup in 1990. 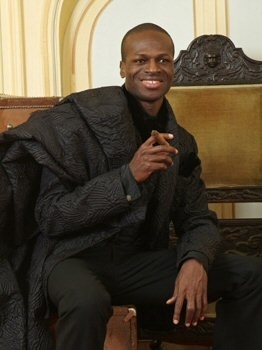 He joined the Ballet National du Cameroun to perform in music videos, concerts and Television. Imane accompanied several artists on tour like Yannick Noah during his European tour ”Saga Africa” , Patrick Dupont in II Dance…le monde”, Alain Marty, Jean Hugues Tanto of L’Opera de Paris”. He did a choreography for George Momboye in 1993. In 1995, he worked with Guem, a percussionist and a Canadian Ballet group , Koke for the choreography of Deborah Brown in ”Cirque de Soleil ” , participated in videos of artists like Mylene Farmer’, Seal, Sting (Brand New Day in 1999) and Fanny Ardant in Phedre. He was nominated at the ”Nijinski Awards” in Monte Carlo in 2000 also serving as dance instructor at Salle Pleyel Jazz Academy alongside Tessa Beaumont. He has been an outstanding dance instructor from 2000-2009. Simultaneously, after being a finalist in Mannequin Europe, he pursued his modeling career with big names in the industry like Piere Cardin,Christian Dior,, Gian Franco Ferré,Yves Saint-Laurent,F Smalto, and Lavin and sportswear companies like Oakley,Lacoste ,Levis,Modal, and Iguana Surf Challenge . In 1992, he presented his “Couture” collections in Paris which were sold on request and made-to-measure and, in the summer of 2007, in partnership with Jean Marc Chauve, he also presented “Createur”, a prêt-a-porter line sold in France, Japan and USA. He is regularly solicited by L’Oreal to participate at ”Haute Coiffure Francaise) and commercials campaigns for companies like Gap, Motorola, Sony Ericsson, Gitanes, Minima optiques, Lynx optiques, jeans Triangles, chaussures Browns, cigarettes Fines. He was photographed with the Wolfgang Skolada jewelry collection and created a line of dresses for the presentation of the Swarovski collection of jewellery and accessories at the Carousel de Louvre in Paris in 2004, and also creates with more accessible brand labels such as Multiples (a French prêt-à-porter label that sells at affordable prices) or La Redoute. Imane presented a collection at La Nuit de Createurs” in PARIS in 1996 clothed top models like Katoucha Niane, Esther kamatari, Rebecca Ayoko, Mounia, Kimi Kane, Debra Show, Kinée Diouf, and Margareth Lahoussaye-Duvigny . The garments of Imane Ayissi’s Couture and prêt-à-porter lines, meld African traditions and realities with western fashion. His collections, often featuring exotic, evocative names (“Ongwass” o “Badjaga” ) combine craftsmanship, materials and traditional African cuts. Together with his use of innovative fabrics there is also often an infusion of typically African-style bricolage or recycling work, references to Parisian Haute Couture and contemporary creativity to create a fashion targeted at an international public. 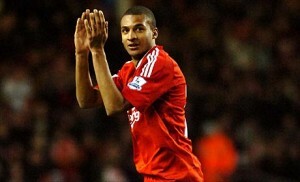 SPORTS: David N’gog and Marvin Matip expected to join Lions. T he Cameroon football Federation , FECAFOOT is actively making efforts to bring in two players with dual nationality to join the Cameroon selection . 25 year old defender, Marvin Matip who plays for Karlsruhe and Liverpool striker, David N’Gog who has been receiving fervent support from Milla. “The ball is in his court, we have shown interest in him and we expect him to react,” says Francis Mveng, vice president of the Federation. An outcome is eagerly anticipated by Roger Milla. According to him, since France is currently in need of a good attacker, it’s time for us to quicky get hold of the 21 year old David N’Gog. Marvin Matip, the Germano-Cameroonian defender currently on loan at Karlsruher SC from FC Cologne, might follow the path of his brother Joel Matip. 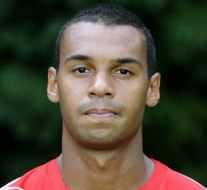 Talks with FECAFOOT have been advanced concerning this player. According to Francis Mveng, he has been issued a Cameroonian passport already but confirmation from FIFA is still pending. Yannick Noah releases new album ”Frontieres”. 23rd August was the day, Yannick Noah unveiled his brand new LP titled ” Frontieres” . Hmm! His multi-colored album cover design was done by Marrko. The 13 track album comprises ”Ma pomme”, which evokes move of artists in New York 2008, ‘No One’s Land’, which speaks of illegal immigrants, ”Angela”, his first single, a tribute to Angela Davis, a pioneer of the civil rights movement in the United States , ”On ne veut plus jouer” , Frontieres , ”Ca me Regarde’ the second single from his seventh album and more beautiful rhythms. Note that Yannick Noah will also deliver a special concert next September 25 at the Stade de France in Saint-Denis, in the framework of a tour planned to showcase his new album to his fans. MAKOSSA: Annie Anzouer releases new album ”Partage”. ”Zangalewa” first lady, Annie Anzouer is back in the music scene after 5 years of absence with a brand new album composing 14 tracks titled ”Partage. Her 4th album ”Partage” , which comes after others like Variations (1994), Visado (1997), Kwassio (1998) and Si Miyala (2004) is meant to share her voice, emotions and experiences with the entire world. The Cameroonian public is already appreciating the album. 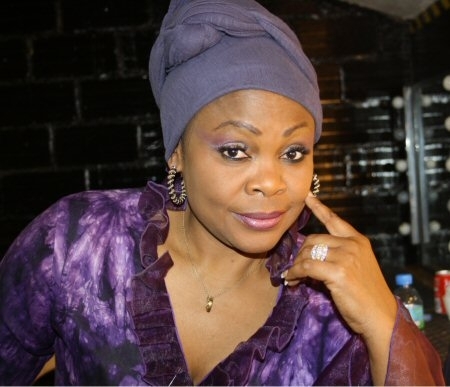 She is currently preparing to perform in a series of concerts around Cameroon. Remember she celebrated her 20 years in the music industry in May 2010. This album has a peculiar feeling due to the participation of his son , Jack Anzouer (on K’mer); Gizly Anzouer (on Abosso); Loue Ze, Valerie Belinga , Sahel (on Toucher tam-tam); Valerie Mengue (on Rentre chez toi); Sandrine Mengue, Epagna Kastro. We shall keep you posted about her upcoming videos.